Whether you need security lighting installed or your hot tub wired, Bentley Electric is the electrician to call in Beaverton, McMinnville, Gaston, Forest Grove and Newberg. Locally owned and operated since 1984, Bentley Electric will provide you with quality electrical services. 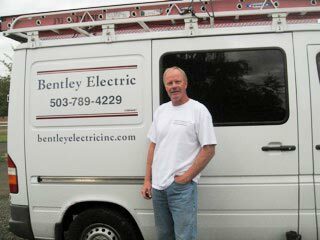 From remodels to installing dedicated computer circuits to troubleshooting electrical problems, Bentley Electric Inc. provides electrical services to homeowners and businesses in Beaverton, Hillsboro, Gaston, Newberg, Forest Grove and McMinnville. Whatever electrical service you need, Bentley Electric can handle it for you. While Bentley Electric provides electrical services for new homes, remodels, and commercial work, our specialty is home remodels. We love the detailed work, troubleshooting electrical problems as they arise, and working closely with our customers to complete the remodel exactly as they envisioned. Unknown hazard in your home? While upgrading breaker panels in your home isn't exciting, it is necessary to replace poor quality breaker panels, such as those made by Federal Pacific, Zinsco, and Sylvania. Poor quality breaker panels run the risk of fire and other electrical hazards, so call Bentley Electric for an estimate on a panel change-out. Bentley Electric was established in 1950 by my Dad, Vernon Bentley. While in high school in Corvallis Oregon, I started helping out with the family business to make extra money. Working as an electrician’s helper, I began to see the “trades” were a good way to make a living, but was not so sure about doing the same work as my Dad. Wanting something different, I proceeded to get my associated degree in HVAC. Well, it turned out heating and cooling work was not for me. I entered the electrical apprenticeship program, and in 1984, bought Bentley Electric from my father. I married in 1980 and now have four children, l daughter and 3 sons. Outstanding service keeps our customers calling us back every time they need electrical services. Service means showing up on schedule, completing the project in a timely manner and cleaning up when we are done. Our employees follow rigorous protocols to ensure the safety of our customers and ourselves during all projects. Bentley Electric strictly adheres to all code requirements and regulations while ongoing education keeps us up-to-date on the latest techniques. If you want the job done on time, on budget &: with a good attitude, call these guys.